My apologies for not posting in quite some time. Was getting ready for a trip and instead got hit hard with the flu and ended up staying home…really ill. But I’m better now and anxious to start making some cards again! Sadly, this is my last CAS Winter Design Team Challenge…time to pass on the torch to the next bunch of designers. It’s been a lot of fun and I’ve enjoyed it thoroughly! Hard to believe my three-month stint is done…where does the time go??? Anyway…on with the card. Don’t you just love these cute little chicks? Thought this was such a fun set for this time of year! Have a wonderfully crafty week my friends! SO sorry you have been ill, Lee-Anne and had to miss your trip 😦 HOpefully you are on the mend now. These little chicks are soo cute 🙂 Love the added splaters. Hope you are feeling better Lee-Anne! 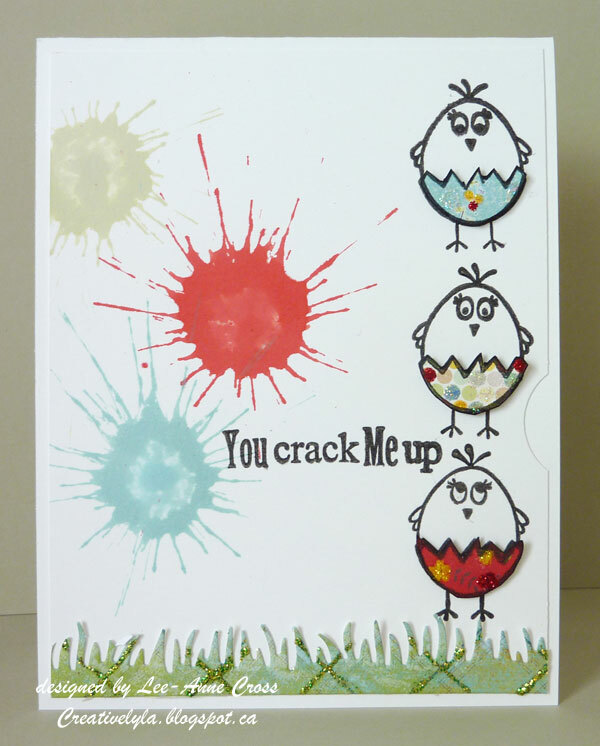 Love your cute card and the humor of the splatters. Awesome!